This 5 bedroom, 5 bathroom home offers plenty of space for your next group getaway. Perhaps you want space for the whole family, a weekend away with friends, or accommodation for your wedding party - this house will serve you well. Boasting brand new furniture, a spacious lounge and gorgeous second entertaining area, this house allows you to escape the reality of everyday life and relax in comfort. The 5 bedrooms and 5 bathrooms, offer you and your guests privacy and space. With views to die for, the upstairs lounge and decking will beckon you to sit with a glass of your favourite pinot, take in the magic scenery, and enjoy a good ole chat. Alternatively the DVD and TV upstairs also offers a nice kids retreat. 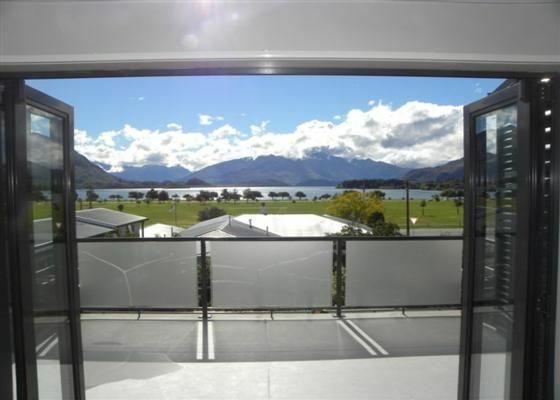 Within a 1 minute walk to town, you will be able to experience some of Wanaka's wonderful cafes and diverse restaurants, while also being only a stones throw from the lake front. Whatever brings you to our little piece of paradise we know that this house will provide you with the perfect place to stay. Cleaning is included in the tariff if the stay is for 3 or more nights, stays under 3 nights a $125 cleaning fee will apply. Great location! Upstairs bedrooms could have used ceiling fans or ac vents as the afternoon sun hits them hard. Kitchen needs additional cooking utensils....there’s plates for 18 but not utensils. Great house - handy location and great views. This was a beautiful house, very close to town with lovely views. Fantastic property which suited us perfectly (2 families of 5). Fantastic property which suited us perfectly (2 families of 5). Everything was super clean and tidy and plenty of space to relax in. Location was amazing so close to lake edge and town. Fully recommend this property. Great place and location for a large group.